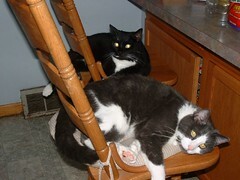 The kitchen chairs are just one of their favorite spots to nap. Friday Ark Centennial Edition is up over at the Modulator. The Carnival of Cats is being hosted by Red Peonies this week. This week’s WCB #62 will be hosted by Heather at http://www.blogger.com/comment.g?blogID=16572342&postID=115587421173067737. Please sent us your Kitty Blog if you wish. Thanks. How cute are they just chillin’ on the chairs? Sweet!